Another title of this article could have appropriately been, “Local Churches Set Aside Differences, Discover They Can Do More Together.” That’s because this is exactly what happened when Operation Love Ministries was formed in Anderson, Indiana. The collaboration and unity among churches representing multiple denominations and cultures make this yet another Jesus-is-the-subject story, and a potential model for other communities. Today, twenty-seven area churches prayerfully and financially support the parachurch organization, also giving governance to the work. As a result, these local churches have access to a tried-and-tested resource to more effectively help neighbors in need. “In any ministry, we can all do more collectively than we can on our own,” Andrea Baker, executive director of Operation Love Ministries explains. “We know that we are the body made up of many parts, and those parts can be scattered across a county, or even across a country or the globe. All of us as individuals, and as separate church fellowships, have specific gifts and talents that we can offer toward helping our neighbors with their physical, emotional, and spiritual needs.” Perhaps that’s why, when Operation Love was founded, then pastor of Madison Park Church of God (North Anderson, at the time)—Jim Lyon—suggested the ministry not be absorbed by any one local church, but be established and sustained by a collection of churches. 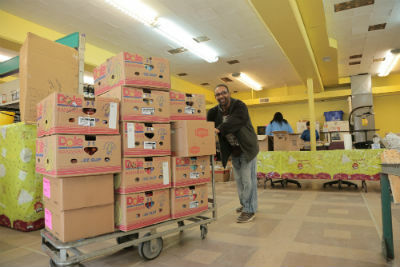 Basic food items are only a small part of what Operation Love offers. Founder Mary Jean “Jeannie” Shaw heeded that advice, and she was glad she did. 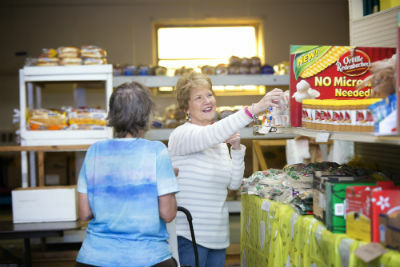 Coming from a troubled background herself, Jeannie accepted God’s call to begin directly meeting the needs of neighbors in the community by collecting household basics, food supplies, and even gently used appliances. All too familiar with tragedy in her childhood and her adult years, she began to use her experience and renewed relationship with Jesus to offer counsel to families in crisis and teach others how to budget. As word of her work spread, friends and strangers alike contributed time and resources to her operation of love. Health issues ultimately prevented Jeannie from continuing the work, and that’s when the need for a cooperative effort became clear. Today, East Side, Madison Park, Main Street, Maple Grove, Park Place, Sherman Street, and South Meridian Churches of God are among the congregations involved in making it all happen for Operation Love. Operation Love churches commit to partner in ministry through prayerful and financial support, offering volunteers, and making ministry needs known in their congregations. In return, these churches receive access to staff resources for referral, training, and guidance, case notes on those who may request assistance from their church, and first access to service opportunities for large groups. Andrea explains that an alliance is set up to promote leadership and investment from the participating churches. “Board member positions are reserved for alliance member church nominations, with three at-large positions for community members also available,” she adds. 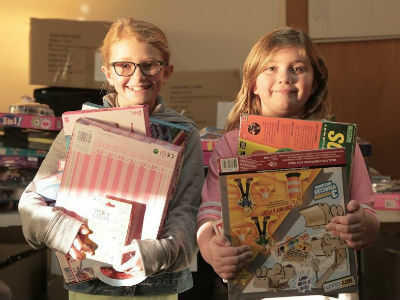 Operation Love collects Christmas gifts for needy families, too. In a letter to area churches last year, Andrea asked the question, “Have you ever had a leak?” She continued, “It starts with a drip, then turns to a trickle. Then, all of a sudden, it’s a geyser…Each day we see neighbors who have had a ‘leak’ in their finances, their relationships, or their spiritual journeys. That leak starts with a late fee, a small argument, or a small medical issue, and turns into eviction notices, broken relationships, and ER visits. When we step in, many times these leaks have already turned into flooded lives, and we are up to our knees in the water helping meet basic needs, while also trying to stop the leaks. But, the workers are tireless, and the rewards are great.” No doubt, the needs are real. And not just in Anderson. But for Church of God congregations across the country, the problem is how to deal with the issues without burning out individual churches and, at the same time, handling tricky situations with grace and excellence. A cooperative, collaborative effort has proved to be one solution in Anderson. Learn more about Operation Love at www.operationloveministries.org. This entry was posted in All Church of God, Give Life, Great Lakes and tagged Anderson, Andrea Baker, better together, collaboration, community, cooperative, IN, Indiana, Jesus Is the Subject, needy, neighbors, Operation Love Ministries, poverty, unity, urban, Volunteers. Bookmark the permalink.